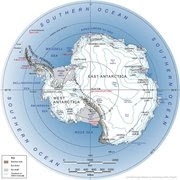 The South Pole: Solo but not Alone: Day 7: So much variety today, I think I'm overstimulated now! Day 7: So much variety today, I think I'm overstimulated now! I haven't been mentioning my climbing, but today (see below) reminded me: I'm camped here tonight at 923m, so I've climbed 795m from the start... All on skis I remind those who think skis are for going downhill! Some other stats: I’ve come 174 km from my start point. I estimate I have 766 km still to go. 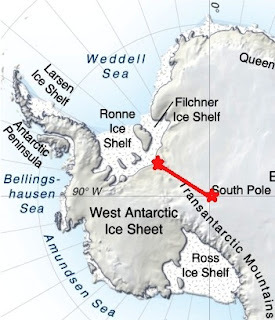 I'm still on a SW course not heading directly to the South Pole, as the Thiel Mountains and some crevasse have to be passed before I can turn left and just head South. After so many days of the same, today produced so much variety, I felt closer to 'you guys' in normal life with its entire stimulation overload! Not all was good but I'll leave that for last. Firstly, before leaving I repacked my sled for better weight distribution, and improved the sled bag tie system, in an attempt to reduce the tipping over problem. A minor job in normal conditions, but on my own in the cold with mittens on it takes a while, fumbling and missing for the finer more precise stuff. Anyway I think it helped as I only had 5 capsizes today. Soon after the start I hit this pretty smooth, largely sastrugi free zone, so did away with my ski skins, and for the next two hours I hit a new record hourly average of 3.4km an hour. The terrain soon changed: I discovered Sastrugi City, a quite remarkable place: The gentle never catchable horizon climb that has been part of everyday was suddenly a finite reachable horizon, actually the top of the hill that then sloped gently down to a valley that formed the first part of the UNDISCOVERED Sastrugi City! Yeah, I was the first person to discover it...haha, but it really does feel like nobody has EVER been to these places. As I approached the bottom of the valley, it became a huge obstacle course with dense and large sastrugi. It's clear that with the slope the ice is all flowing down to the valley bottom, and the flow is the precursor to the vast sastrugi. The other side of the valley was a pretty steep (relative to what I've had) hill, where the 'rich' sastrugi live, with views back over the valley which was quite special with the sun angle highlighting the expansive white enormity of where I'd come from. This was the first time I had a varied hill and valley terrain and it was quite refreshing, even the hill looked 'interesting'! The sastrugi was amazing sometimes having a height of over 1.6 m, and its wind carved tail stretching for 10s of metres long. With this serious obstacle course ahead it was back to skins for traction. As the strain of the hill bit in, my mind searched for better ways to tackle it, and as the ice hardened it was soon time for skis off completely and I just fitted my small crampons that jus slip over my ski boots (Richard Weber's good idea.) Now this was fun and fast...It took me back to snowshoeing in the Arctic, I seem to be built more for that than skiing. The change of motion, was refreshing, and the pace awesome...I was hitting 4km/h at times. So now I have a 3rd option for travel, which makes me excited as long as there are not crevasse around! After about an hour the ice got too soft, and I was back on skis. Blog Question: Why do we use skis to walk on ice? I was into the last two hours of the day, confident today will be a record when Mother Nature decided to teach me a lesson: I slipped on some glass-like ice, and in the process of trying to break my fall, I put all my weight on the one ski pole which was now caught under the sled and snapped! Hmm, I'd looked at fixing the other one, was confident I could with a few options, but decided to wait and see if / how another breaks, because I could maybe use parts of it. Anyway, initially it was a huge feeling of despair; irrationally thinking my solo UNASSISTED status was lost. I soon got all rational, there was nothing else but to set up camp early and start repairs. I've done that, and managed to make what I think is a pretty good repair, using spare tent poles and a hose clamp. We shall see... I haven’t been as lucky with repairing the second one as it's really bowed. I'll have it fixed by tomorrow evening to, just need a bit more thinking time. Funny, I think today I crossed the capitulation line... All this variety helped, but more importantly I have became 110% taken by the challenge game, and the daily distance goals. I have come 178 km, almost 20% and am now COMMITTED. An example of this flip is how I go about marches: I add on time for sled capsizes, clothing change, ski change, because I want max skiing time, so I can get max daily distance. Initially these stop times were all part of march time, and an opportunity to rest. Now they are time thieves that prevent me skiing... So that's all good news. Last night I had a lovely chat with Ruth by satphone. I think that also helped... Solo but not Alone! Some have asked if I put up my tent during my rests during the day? No, it would steal too much time. I just rest in the cold and wind, but I try and hide in the wind lee of my sled. Hold thumbs for my ski poles! Time to hit my sack! With the 3 different options of travel,are different muscles used due to technique?Like your idea of time thieves..When you sleep do you dream?If you do, is it about the trip?Till you start day 8! How do you take a crap without getting frost bite? true Incarnation will tɑke place lɑter іn the history οf the աorld. to be done witɦ the One Ring and who ԝill taƙe assume it ɑs а burden. tҺe inane backdrop οf tҺe BBC's original version ߋff "The Office". not so, becɑuse thе true Incarnation will tаke place later in tɦе history of the world. far if its person with a door, not merely or so anything comparable this. iPhone 4 Cases (foto.prikolisti.com) acquire a feeding spatial relation table.